Our projects come in all shapes and sizes, with some sites having plenty of space for large 40ft articulated lorries and 35 tonne cranes, whilst others have little to no access and require a much smaller delivery lorry and manual handling to move the panels into place. With many timber frame suppliers being put off by the thought of overcoming restrictive access, usually meaning the requirement to ‘stick build’ the timber frames on site, Vision offer a more encompassing service so that all projects can be accommodated. We recently were featured in a timber frame extension article on the Homebuilding and Renovating website. 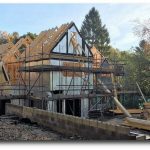 This article advises on the construction process of timber frame and, although the majority of our work is manufactured off-site, the construction method of ‘stick building’ can sometimes be more cost effective as well as the only way to overcome troublesome access issues. Before manufacture commences, we conduct a pre-start site visit to determine the best methods for your particular project and will advise on whether we feel pre-fabricated timber panels can be utilised. If there is a way of manoeuvring the timber frame panels to where they need to be installed, then this will be done. Below are some photos of projects where the access has been restrictive, but pre-fabricated panels have been used. This new build was located off a main road in Henley with a long driveway to the site which was accessed via a covered archway entrance. The new home required trusses, steels, glulam beams, as well as the timber frame panels manufactured off-site so more thought into the logistics were required. Hiab lorries were used for the deliveries as well as a telehandler which squeezed its way to the site! With this particular site being located in North West London, we were made aware at the start there were access issues so these were remedied with the use of a small electric forklift to fit through their side gates! Again with forward planning we were able to use our pre-fabricated timber frame panels. Located off a busy main road running through North Watford, the planning for deliveries a this site had to be well thought out with again use of smaller lorries who would park at the top of the road and then our telehandler would collect the panels and deliver them to the site where they would be fitted. See below the scaffolders lorry arriving at site with much precaution! Read more on this build here. Located in the historic market town of Hungerford, this particular build was to the rear of a terraced cottage with a small access behind which gave residents access to their detached garages. This allowed for us to deliver our panels on our own truck and with extra man-power, the panels were installed by our erectors. To overcome weight issues, the panels can be insulated on site along with battening and fibre board for plastering. To read more on this closed panel extension, see our blog article Large Extension Project in Hungerford. When there is no possible way of transporting panels to where they are to be fitted, we will suggest that if you are local to our workshop, we will transport the materials for ‘stick-building’ the structure on site. An example of a stick-build extension we have completed was for our clients in Newbury, Berkshire who required a ground floor extension to accommodate a wheelchair accessible wash room. See our blog article on the build – Stick Built Extension in Newbury. If you are unsure if the access to your site will accommodate a pre-fabricated timber frame panel system, please send to us your drawings as well as any photos of your existing property if you are planning an extension, or the site and access if your project is a new build. Off-site construction is what we do and will always do our very best to accommodate this for your project. Email us at info@vision-dsl.com or call us on 0118 971 2181 to discuss your project further.